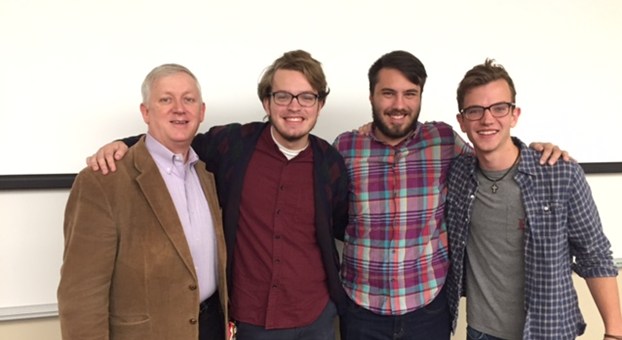 Honors students Randy Westergaard (junior Christian ethics and worship major), Cole Fuller (junior Christian leadership major) and Taylor Brown (junior church leadership major) recently shared their Maymester experiences in Germany at a convocation event. The group traveled to Germany with Dr. Gwaltney, dean of the College of Theology and Christian Ministry, to explore the origins of the Reformation. Oct. 31, the day of the convocation event, marked the 500th anniversary of the historical moment when Martin Luther nailed his 95 Theses to the doors of Wittenberg Cathedral. This moment marked the beginning of the Reformation and the origins of the Lutheran religion. Westergaard, Fuller and Brown each shared their photos and stories from the trip as well as details about the impact the experience had on their faith journeys. The Maymester trip to Germany will return in 2018 to teach students about the Catholic St. Francis of Assisi and Martin Luther, led by Dr. Ann Coble and Dr. Regine Schwarzmeier.